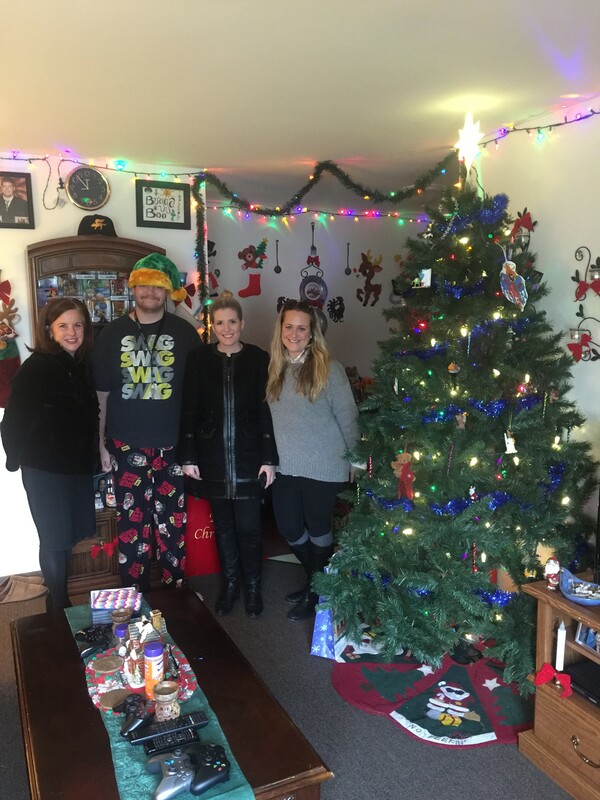 Home / Apartment News / Christmas Cheer in Chilton! 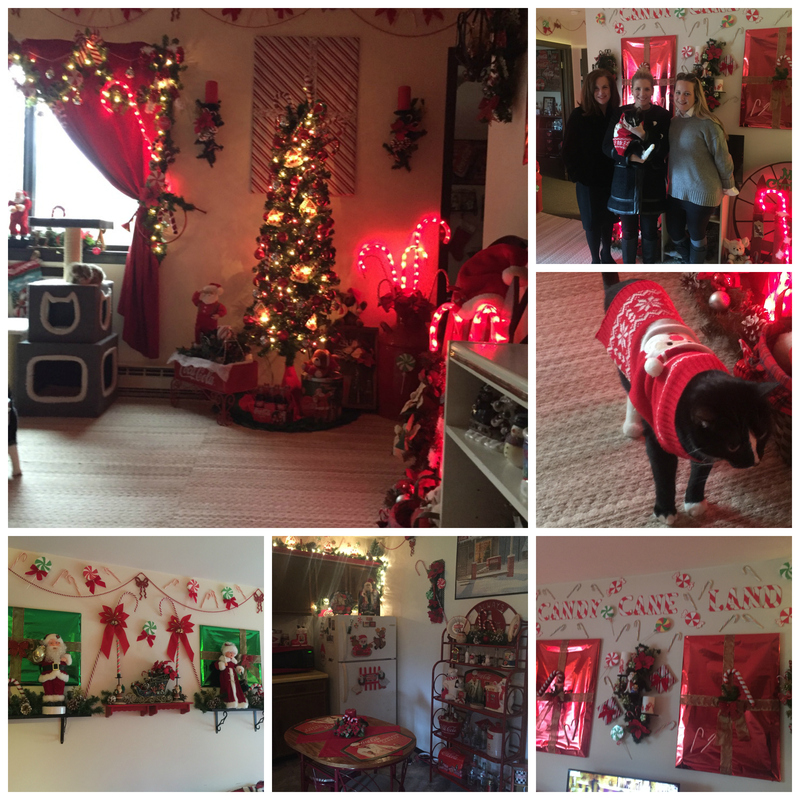 To say our Residents at Diane Manor Apartments in Chilton have holiday spirit, is an understatement! Burke Properties’ President, Director of Sales and Management and Marketing Director visited the twenty-four unit building and were honored to get tours of three unique apartments. Kole, who has lived at Diane Manor for years, had lights strung all throughout his unit and had decorations affixed to the apartment walls including his kitchen. He regaled us with some tales of his recent family birthday visit and even showed us a couple of his awesome hats (swapping his Walking Dead hat he was wearing for a Packers Santa hat for the photo). The second visit was to Mary’s unit, which although usually decorated with a vintage Coca-Cola theme to it (including some of the best Coke-themed items we have ever seen). 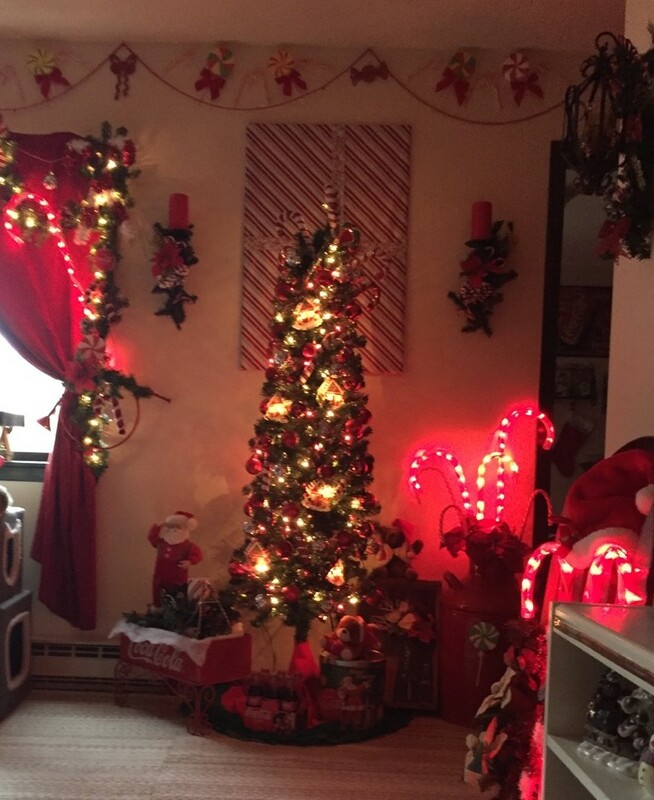 Mary had started decorating early in November for Christmas and created “Candy Cane Land” right in the middle of her cheery apartment. Her pictures covered in red foil became gifts all around, and the wrapped lollipops, hung like a crown molding, made this a delicious visit. She even dressed up her beloved cat in a bright Christmas sweater to greet us. Last, but certainly not least, we visited Don’s unit. Although he had not decorated for Christmas, he had the finest “outdoor living’ themed decor you could hope to see. 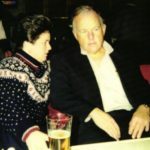 Look out Camp Bar Shorewood – you got nothin’ on Don. He takes pride in building almost all of the furniture and decorations in his unit himself, and he is one talented guy! He enjoys listening to the radio while specializing in his carpentry projects. During our tour, he told us that his father in law was a contractor on the building in which we stood, Diane Manor! What fun. In addition to the amazing holiday spirit throughout the building, the residents keep up a community garden in the warmer months and have a patio area for parties. Thank you to Dave Papez, who is part of our maintenance team, for coordinating the tours and telling us all about the culture of Diane Manor!